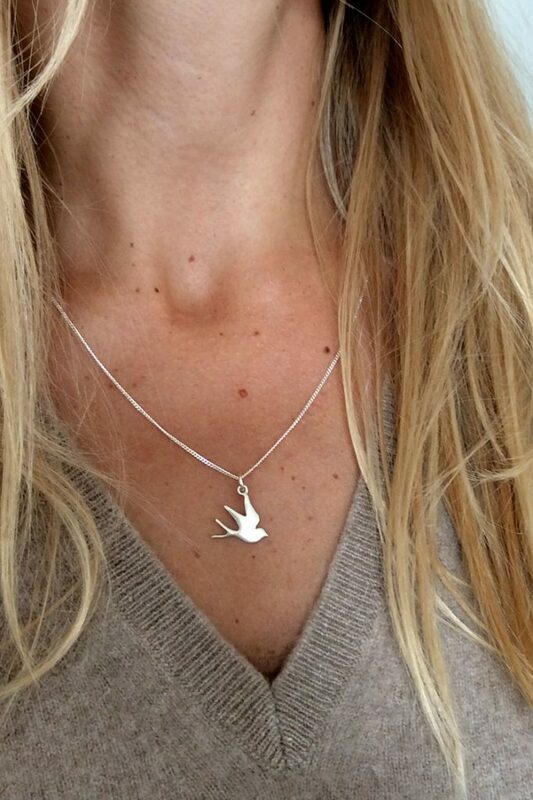 The Swallow Necklace is an ideal little gift for the one you love the most. With the Swallow being renowned as symbolic of loyalty, freedom, and hope, these are all great sentiments to wear and give. Stuck on what gift to get for your daughter, niece, best friend or goddaughter? Then the Swallow Necklace is a perfect choice and sure to go down a treat with your loved one. What did swallows mean historically for those venturing on adventures? Historically, the swallow carried great symbolic value for brave, adventurous sailors to show their sailing experience and adventures. A sailor would have one swallow tattooed on their body before setting out on a voyage, and the second swallow tattooed upon his return to the home port, once completing his journey. Should a sailor not make it back; the swallows would carry their soul to the heavens to be laid to rest in peace. This led many sailors to start embracing the Swallow as a symbol of hope and the successful completion of a long voyage. Seeing swallows was a sign that they were nearing shore as these birds never travelled far out to sea and so motivated the sailors on the final miles of their journey back to the mainlands. Today the symbolism of the Swallow still bears importance to sailors, and in general has become an ever-increasing symbol of good luck. For many, many years the Swallow has also been considered a symbol of the Spring awakening – the revival of life and love. In classical Chinese paintings, the swallow symbolises happiness and the emergence of Spring. Additional portrayals show the bird as, daring, risk-seeking and a symbol of change for good in the future. The swallow is described in old Egyptian poetry, delivering the first sign of new love. Echoing the belief of the swallow symbolising love, care, and affection towards their loved ones. What great sentiments for someone to give or for the wearer to carry around their neck, with our Swallow Necklace, knowing that these values symbolised by the Swallow have strong connections with various cultures from all over the world. Swallows also have great prominence in old Portuguese traditions and cultural art. The Swallow, or andorinha in Portuguese, appears in Portuguese homes and became a symbol for the house after one of the most well-known artists that Portugal has had, Rafael Bordallo Pinheiro, produced a set of ceramic pieces resembling the swallow in 1891. The Swallow bird has become a very integrated feature of a Portuguese home, a tradition that still lives on today. As the swallow is a migratory bird which always returns to the same place to nest year after year, it is said they always return because a swallow only has one partner throughout its life. So it is no wonder that the swallow is a bird associated with values such as home, family, love, fidelity, and loyalty. As part of the tradition and tale surrounding these Portuguese Swallows, they were exchanged between lovers. Our Swallow Necklace has been greatly inspired by the notion of love and romance, and this cultural tale of the Portuguese ceramic swallows being exchanged between loved ones beautiful encapsulates such emotions. The Swallow Necklace makes for the ideal gift for the one you love most, to remind them just how important they are to you. So what if your girl already has a favourite necklace? First things first, a girl can never have too much jewellery, from simple pieces to bold statement pieces, from every day to the daytime only to the sophisticated evening jewellery, your girl can always find an excuse to add more jewellery to her seemingly never-ending collection. So really, you’re helping her out, and jewellery is a safe bet that you will make her day and years with our Swallow Necklace. Layering jewellery is also hot on-trend, so why not get a different chain length to your loved one’s favourite necklace so that she can wear both every day. Team up the Swallow Necklace with her favourite necklaces. Or why not double up the Swallow Necklace with other Bianca Jones Jewellery charms, to make the necklace all that bit more symbolic. Give your loved one extra luck by teaming up the Swallow Necklace with the four leaf clover charm, doubling her chances in good luck and fortune, a perfect gift for someone needing that extra bit of luck. Perhaps before her exams, her university finals, her wedding day or just because. Or for the love and romance, the Swallow also symbolises, you could add the Love You More Charm or Love Heart Charm to make her feel extra loved with your gift. This doubled up necklace would make the ideal gift on Valentines. With the Swallows symbolic value to sailors and the protection, they bring the Swallow Necklace makes for a great gift for the recipient if they too are an avid traveller. As a token of luck, protection and guidance on your loved one’s adventures so that they can carry a memento of you with them around their neck on their journey. Personalise the Swallow Necklace further, and team it up with a Latitude and Longitude Disc Charm, the perfect necklace for a traveller. Choose a location of somewhere precious to the wearer or both of you and have the latitude and longitude co-ordinates hand engraved adding a beautiful personal touch to your gift. The destination could be your home, or perhaps the recipient’s favourite destination, wherever you choose it will be a treasured engraving as the coordinates are determined by the starry heavens above. So the Swallow Necklaces makes for the ideal gift, as a single simple pendant or as in some of our combinations with other Bianca Jones Jewellery as previously mentioned, now it’s just a question of the tough choice in what to choose! Swallow Necklace makes for the most meaningful and thoughtful gift to show your special someone just how much they mean to you. The Swallow Necklace is available in all precious metals, to suit all those who may have a preference to team gold or team silver. We offer Sterling Silver, Yellow Gold Vermeil and also new to Bianca Jones Jewellery, we also offer Rose Gold, a perfect blush pink to really turn up the love. Remind them of just how you care for them with this symbolic piece of jewellery.